In a few posts back, I wrote about how I don’t like to depend on pre-packaged foods and how the best diet is one that is based on fresh produce. I’m a big fan of eating whole foods, and I’ve found that I feel better when I don’t eat food that has processed forms of protein (whey protein, soy protein isolate, etc.) especially when it comes to energy bars. Energy bars, or any kind of packaged “bar”-type foods have become increasingly popular in the last decade or so, with good reason. Many of us are so busy that these packaged bars provide a quick solution to hunger. I used to be a huge fan of Luna Bars, but I realized they were so sweet that I was tempted to eat many of them in a sitting (which I often did!). That was a red flag to me, along with the fact that a lot of the ingredients don’t agree with my stomach (more than one Luna Bar in a sitting results in stomach pains for me) and are highly processed. For the past few years, my go-to “energy” bars have been Larabars. I love these little rectangles of goodness because the ingredients are so simple and healthy. Each bar contains dates, and usually nuts like almonds, walnuts, pistachios, cashews, etc. Some of the varieties also contain additional dried fruit, like dried blueberries, dried apples, dried cherries, etc. and spices, like cinnamon, nutmeg, cloves. A few of the flavors also contain chocolate chips (the ones Larabar uses appear to be vegan). What I love about these bars are that not only are they really simple and healthy, they’re much more satisfying than a processed food bar. The fat content is higher in Larabars (compared to other bars) due to the nuts, which makes it a little more filling and satisfying than a lower-fat bar. These bars are also gluten-free, which makes them appropriate for anyone with Celiac Disease or a gluten intolerance. Because they are so easy to make, if you wish to make your own version of Larabars, simply use a food processor to blend together dates (pits removed), nuts, and any other dried fruit of your liking. I haven’t yet created my own fruit and nut bar, so if you try this on your own, you might have to experiment with the ratio of fruits:nuts. If you haven’t tried Larabars, they’re available in most health food stores. I usually buy mine at Trader Joe’s, Whole Foods, or Fairway (a northeast supermarket chain) and you can also order them online. 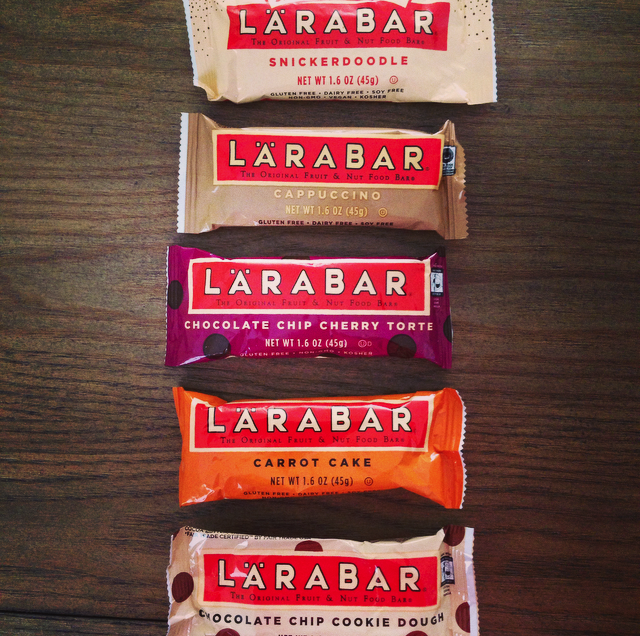 Feel free to share your favorite flavor Larabar by leaving a reply. Note- This post, and any other post based on a particular product, is not a paid endorsement. I truly love Larabars and bought all of the above varieties for $1.49 each.